New research by Adthena uncovers the extent to which Google Shopping ads, commonly referred to as Product Listing Ads (or PLAs), have become the most popular ad format for retail advertisers, with ad spend now far in excess of text ads in retail categories. Google Shopping ads now drive 76.4% of retail search ad spend, generating 85.3% of all clicks on Adwords or Google Shopping campaign ads. This report benchmarks Google Shopping (PLA) ad spend across 40 million ads in the US/UK. From 267,000 competitors, encompassing over 1 million search terms. The data reveals the true extent of Google Shopping ad format adoption in the US/UK, among advertisers across retail categories such as Fashion and Apparel, Consumer Electronics and Home & Garden. “The bigger picture here is the shift in which audiences are consuming new ad formats,” says Ashley Fletcher, VP Marketing at Adthena. “As retailers move ad spend into Google Shopping or mobile campaigns, the retailers who master the nuances of specific categories will be the ones who shape consumer’s ad experiences." Across US online retail, Google Shopping Ads now make up 76.4% of retail search ad spend, and win 85.3% of all clicks. 23.6% of ad spend generated 14.7% of clicks on text ads. And in the UK, retail advertising spend on Google Shopping Ads now amounts to 82% of retail ad spend, attracting 87.9% of clicks. 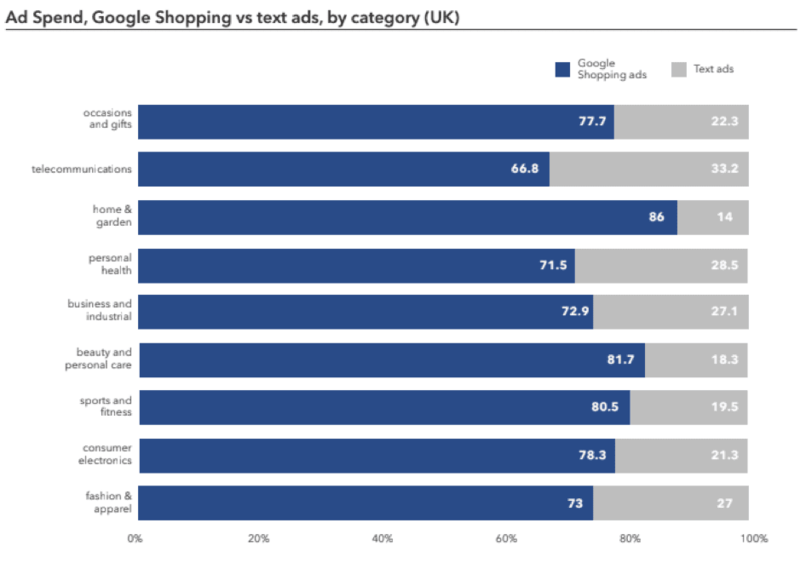 UK Google Shopping ad spend was even higher, 82% of ad spend was responsible for driving 87.9% of clicks on shopping ads, and 18% of ad spend drove 12.1% of clicks on text ads. Investigate the value of competitive intelligence. Conduct gap analysis across a retail market in order to analyze the value of opportunities around Google Shopping. Leverage machine learning for search term categorization. Build a comprehensive understanding of consumer search behavior. Optimize, streamline, and get more value from Google Shopping campaigns. Integrate Google Shopping campaigns with Adwords/text ad campaigns, and respond to changes in the competitive market. Thanks to Lorna for sharing their advice and opinion in this post. Lorna is responsible for acquisition mrketing at Adthena. You can follow her on Twitter or connect on LinkedIn.